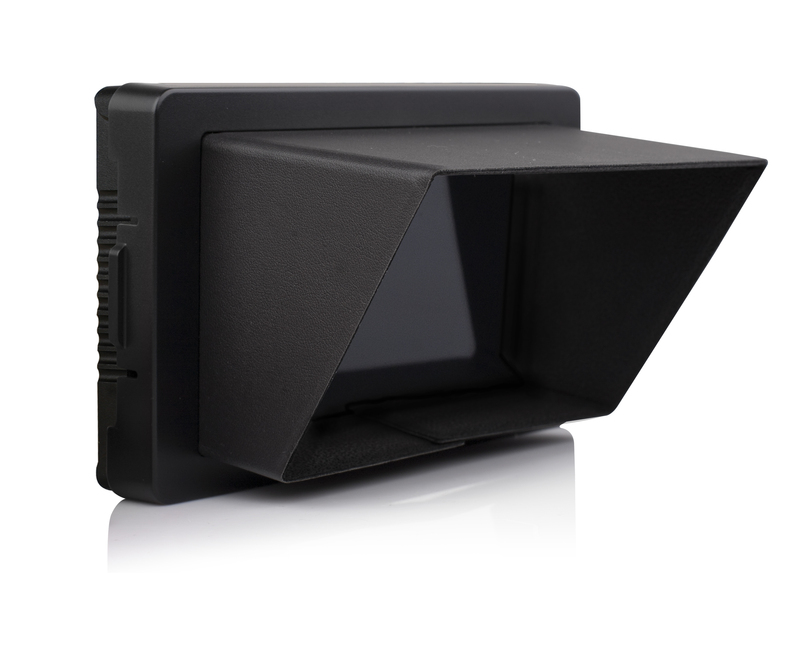 S-1053F adopts aluminium alloy housing, thinner and robust, suitable for outdoor on-camera video monitoring. 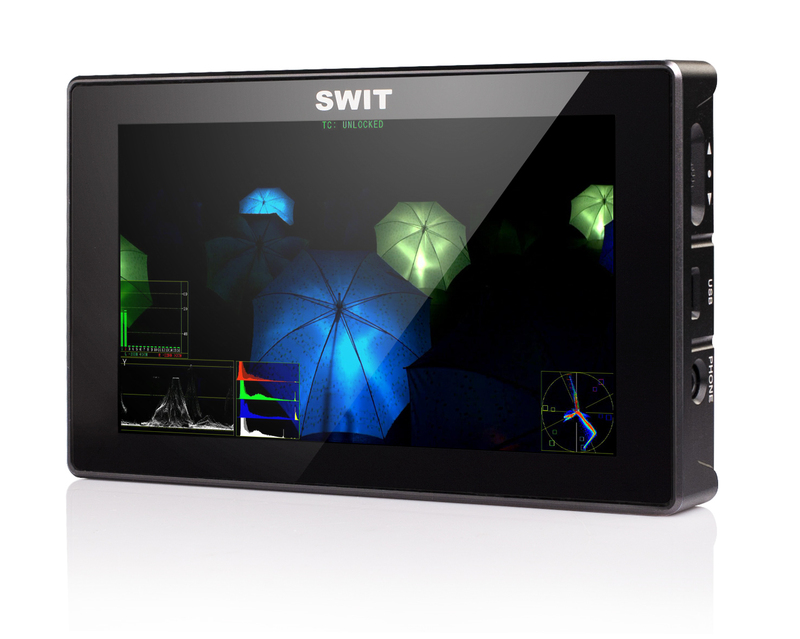 Note: When both SDI and HDMI input, if the current display source is SDI, the SDI output port is SDI loop; and if the current display source is HDMI, the SDI output port is HDMI conversion output. 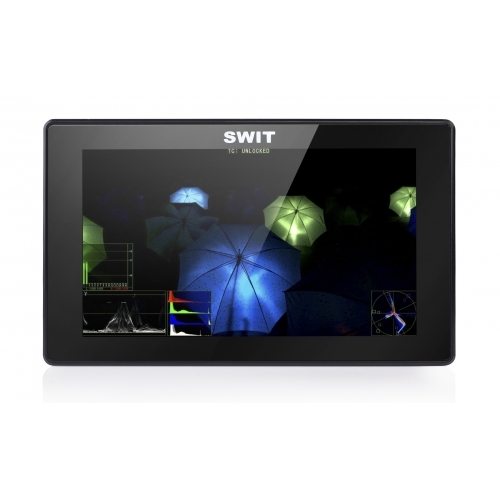 S-1053F supports video analysis assistant patterns includes: Waveform (Y/Pb/Pr/R/G/B), Vector scope, Histogram (R/G/B/Y), to convert the digital video quality info (Luma, Color, Saturation, etc) to patterns, and the patterns can be switched on/off individually, select display position (Up/Down/Left/Right), size, color, and translucence. 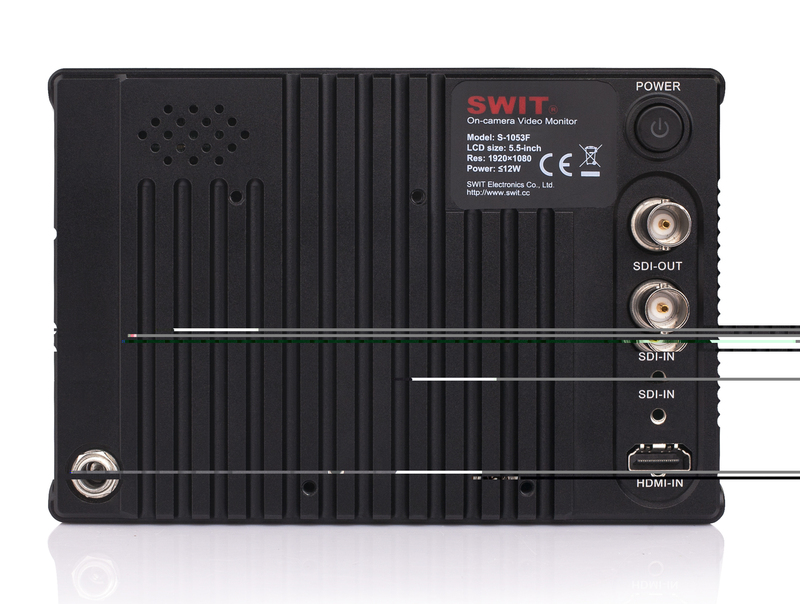 S-1053F supports SDI-16ch and HDMI-8ch embedded audio meters display, with marks and audio abnormal alert info. Users can also select any 2 channels audio to output via 3.5mm socket or speakers. The audio meter pattern position can be selected from one of four corners, and you can select to display only 2 channels, 8 channels, and full 16 channels. Also scale markers, alert info, and translucent of the audio meter pattern are selectable. S-1053F has a Revolve/Push Menu button, with one-button operation for menu system. On the top of the monitor there’re 3 user definable function keys, and under the menu system, press F3 at any time you can quit menu directly. 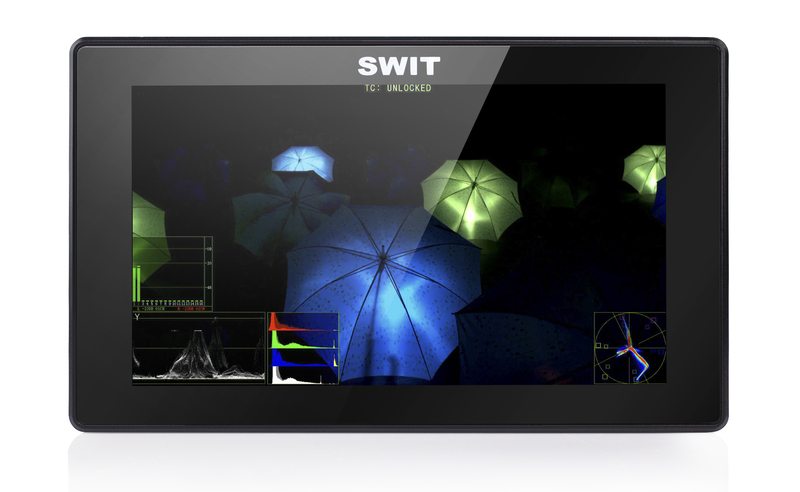 Input source switch, Max backlight, Waveform, Info display, Color temperature, Timecode, Zebra, Vector, Audio meters, Histogram, False color, AFD, H/V delay, R/G/B/Mono, scale markers, Colorbar, Audio alert, Peaking focus assist, Aspect ratio, Scan mode, Zoom mode, Mute, Freeze frame, Flip. The monitor provides a Micro USB port on the side, for firmware upgrade. Users can download the latest firmware file to a USB stick, and insert into S-1053F monitor (via Micro USB OTG cable) to upgrade, without PC connection. The HDMI input port of S-1053F is lockable designed. 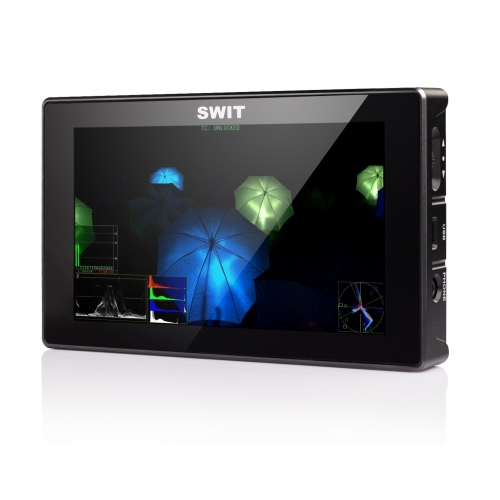 SWIT provides a special HDMI cable with lock for S-1053F monitor, and this HDMI connector can also work with normal standard HDMI cable. 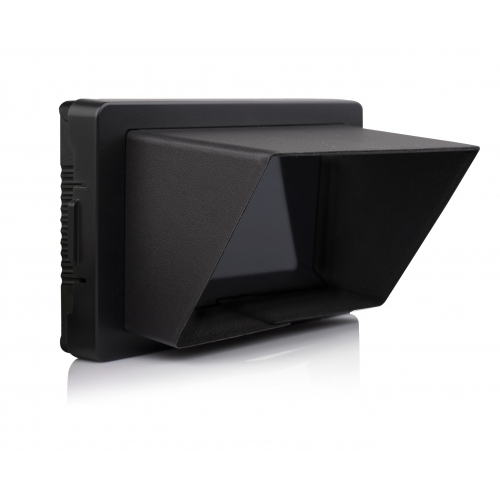 For outdoor using, the S-1053F provides a sun hood that is foldable designed and snap-on installation to the monitor. S-1053F offers the simple package and luxury package for option. 1. Download latest firmware files (including Driver and Kernel) in USB disk - root directory. 2. Switch on the monitor, and insert USB disk into the Micro USB socket via OTG cable. 3. Enter Main Menu – System – Update Driver, select YES and the monitor will upgrade automatically, and will restart when upgrade finished. 4. Enter Menu – System – Update Kernel, select YES and the monitor will upgrade automatically, and will restart when upgrade finished. Please DO NOT cut off power during firmware upgrade. It is suggested that you could connect both AC-DC adaptor and battery.